The Colton Fly Company fly rod and reel sale has only a few days left. The sale ends this Sunday, January 15th. 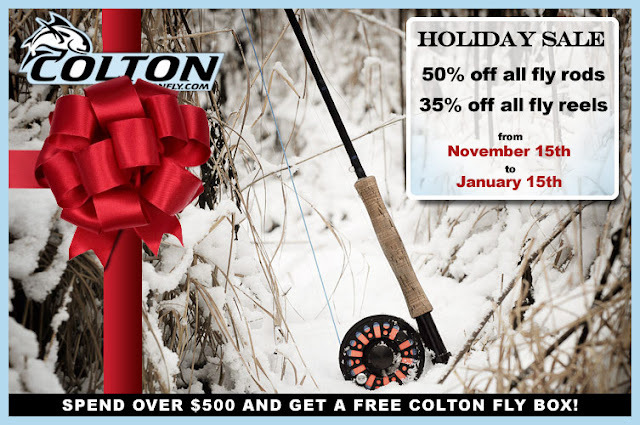 Save 50% off Colton's normally low prices on their complete line of fly rods and 35% off reels from 2wt to 20wt. Because you purchase directly from the rod builder, Colton fly rods and reels are about half the cost of other high end fly fishing outfits, with the same high quality of craftsmanship and materials. If you have been in the market for a new fly rod and reel now is the time to buy. You won't find high quality fly rods and reels at these prices anywhere else. Click on the image below to see the full line of Colton fly rods and reels.